There are moments in life that define you. They make you stop dead in your tracks. They make you reevaluate who you are and where you are going. Sometimes you can see it coming and other times it’s like you were hit over the head, knocking you to your knees. That moment for me was when I was diagnosed with breast cancer in March 2010. What I remember most are the incremental moments along my cancer journey. The day I was told I had the “C” word. The first weekend after being diagnosed before starting my rounds with the doctors, I felt like I was cramming for a test. I wanted to be prepared for anything and everything they were going to tell me. The day I had my port placed in case my veins didn’t cooperate. It ended up being one of the best decisions I made, as chemo sent my veins packing. They are just now coming back to life. The first day of my chemotherapy treatments. I remember sitting in the waiting room. It felt like forever before I was called back. My stomach was in knots. I tried to joke with family to keep my sanity through it all. Then I looked across the room and saw other patients sitting there waiting for their turn. It was quiet in the waiting room, but as we looked at each other and smiled we were giving each other support as we entered into the unknown. It was during my treatments that I met my breast friend. No, I spelled it correctly. That is what she and I began calling ourselves. We were on a similar treatment plan with her being a treatment ahead of me. We were sitting next to each other, hooked up to the machines that were providing us our medicine. Ellen Degeneres was on TV and it was at the start of the show where music plays while Ellen dances in the audience. Little did we know at the time that we were dancing in our chairs to the music. We looked at each other and laughed. It was in that moment that I knew we would become fast friends. It was such a relief to me to have someone there that could relate to what I was going through. She was ahead of me, so I would ask her questions to see how she was feeling and what did or did not help her. My favorite thing that we would do is race to the bathroom 🙂 I know – probably not the best place to do that, but we did and we would laugh. As soon as I saw her motioning to get up out of her chair, it was on! It was like we were the only two there and we found ways to laugh through the process. We were there for several hours, so we made the best of it. Recently, Brandy’s cancer has come back. I am crying even as I write this as I miss my breast friend and wish that I could be there to comfort her as she goes through another battle. I know that she is strong and WILL beat her cancer! She is the reason why I am writing this blog post; I want to dedicate it to her and others that are fighting cancer. I ask those reading this to post positive comments and to pray for them! Prayer is so powerful and I know that together we can give those fighting cancer the strength to keep moving forward! For those battling cancer, don’t give up! Keep fighting and know that you become a survivor the first day you start fighting back! Keep moving forward even if the steps you are taking are small. I will continue to pray for you and hope one day that we will find a cure to send cancer packing. 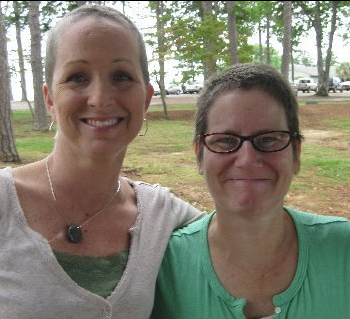 Brandy, I love you, my breast friend, and will continue to pray for you! You are an amazing wife, mother, daughter and friend to so many. I hope to see you soon and know that we are here for you! This entry was posted in Uncategorized and tagged Breast Cancer, Columbia, every woman blog, Famously Hot, lexington medical center., Midlands, South Carolina by lexingtonmedicalcenter. Bookmark the permalink. “Life isn’t about waiting for the storm to pass, it’s about learning how to dance in the rain.” Music soothes the soul so I say turn up the music and dance! Girl, rock it! Show it who’s boss! Your meeting together was such a divine appointment! God knows JUST who to send into our lives. May you two have many years of “racing to the bathroom” together! Meet my breast friend, Brandy! She continues to inspire me every day. Keep fighting and stay strong my breast friend! Hard to believe it has been 8 years since I met Brandy and we fought our cancer together! Wow, where has the time gone! 🙂 I hope everyone is doing well and to those currently fighting cancer, lifting you up in prayer!